Open 7 Days a Week from 11:00 a.m. to 5:00 p.m.
Thursday is our Late Night ! We are open until 7 p.m.
Sunday, May 19, 2019 - 11 a.m. to 5 p.m. Winner of Burlington's Best antique shop for 8+ years ! 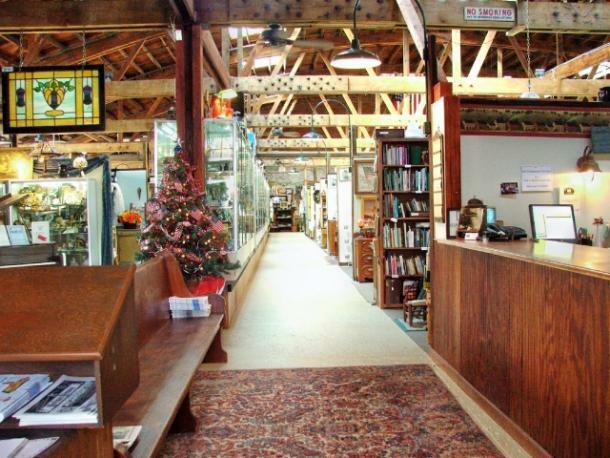 The Historic Burlington Antiques and Art Emporium is south-central New Jersey's biggest and most diverse antiques shopping location. There are over 65 individual antiques dealers and collectables dealers under one roof. You will find furniture, primitives, toys, glass, pottery, trains, books, military collectables, radios, paintings, photographs, kitchenware, depression glass, china, dolls, magazines, clocks, jewelry and much more. Enjoy shopping in this beautifully restored 14,000 square foot building. The building is a brick and arched wooden-truss structure with a 35-foot high arched pine ceiling. The Delaware River is just 2 blocks away. You will find historic neighborhoods (click for link) to tour and dining locations to please young and old. What a fantastic setting to enjoy antiquing! We are located just 2 miles from the Burlington-Bristol Bridge in the historic City of Burlington, New Jersey. Our doorway is under the arched sign. Look for the gold statue of Mercury across the street. We are just 5 miles from Exit 5 on the New Jersey Turnpike which makes the trip an easy drive from Philadelphia or New York. If you take the Riverline train, you will find us only one block from the station.